It’s infamous but what does the Social Protection Minister make of Mario Rosenstock’s take off of her? IT’S ONE OF his most famous or infamous impressions but Joan Burton always tells Mario Rosenstock that he has a bit of work to do to get her voice just right. The comedian and impressionist has done various sketches involving the Labour deputy leader including one particularly infamous one of her singing a version of Miley Cyrus’s ‘Wrecking Ball‘. But what does the Minister herself make of the impressions? 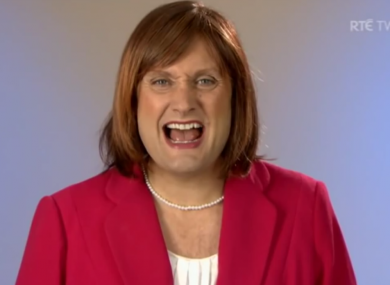 Email “'I keep telling him to work on that voice' - Joan Burton's advice to Mario Rosenstock”. Feedback on “'I keep telling him to work on that voice' - Joan Burton's advice to Mario Rosenstock”.